Oh and a deep purple eye with a darker green throat pouch. 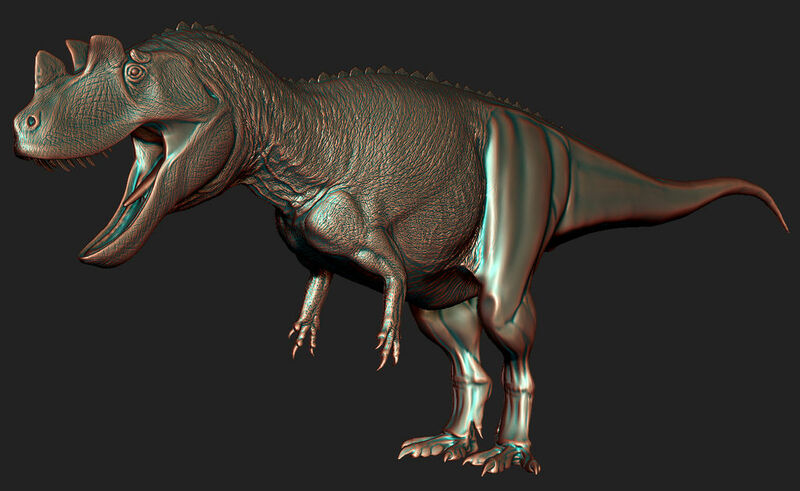 That more cute ceratosaurus also has lips and teeth in this project are differentiated. I congratulate you. Lovely! Ceratosaurus is one of those dinosaurs that really benefits aesthetically from the addition of "lips", in my opinion I like the skin and keratin textures you've got going on as well. This is a beautiful model, very detailed and lifelike. I can't wait to see what it'll look like all textured up. One thing I would say is maybe you could replace some of the wrinkles with fine scale detail and make the area around the eye a bit less sunken and shrink-wrapped looking. Though of course you are the one making the model and so I trust your judgement as to what's going to look right! thank you both i really like the way cerato is turning out as well. the wrinkles are here to stay. theres going to be a lot of added scalations fitted to this model so it will make them more subtle once added. plus wrinkles also serve a thermoregulatory role in large animals. I agree that wrinkles are a good thing, just thought the smaller ones + scales might make things look a bit crowded. They probably won't though - bare in mind that I'm used to working in 2D not 3D when making and completely original piece! Anyway, glad I could be useful. Looking really nice so far! I love the hands. more progress on the big guy. while making and researching this theropod it really made me appreciate how utterly amazing it would of been in life. Magnificent sculpture of ceratosaurus @spinosaurus1 . The ceratosaurus with lips reflects that the theropods were more beautiful than previously believed. The fleshless teeth gave the theropods an unreal and nightmarish image other than that they were not natural. Indeed, what a magnificent beast! My only nitpick (and it really is that) is that at the moment the legs look more like a muscle diagram than muscles with skin on them. However, I appreciate that they're still a work in progress at this point and will probably look a lot better when more texture is added. You are making some really nice sculptures, @spinosaurus1 ! I really like both models. Sorry for the stupid question, but these sculptures will remain forever just as virtual 3D images or you’ll print them as resin/plastic figures? I ask this thing because I’ll probably get a Sinosauropteryx figure like the one you are making, which is excellent.